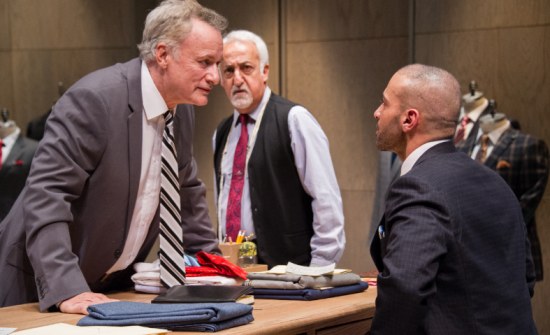 In the original 1982 New York Times review of the Public’s production of “Top Girls,” critic Frank Rich explained the way that the playwright Caryl Churchill sees the theatre as “an open frontier where lives can be burst apart and explored.” It recalls an image of the playwright as a conjurer, creating characters like stars and comets in space then having them blow up before the audience’s eyes. 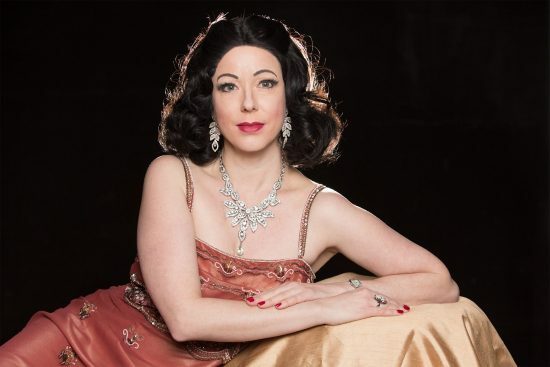 The play centers around the character of Marlene, played by Keegan newcomer Karina Hilleard, as she hosts a dinner party with several interesting characters to celebrate her new promotion. Elsewhere her niece Angie, played by Helen- Hayes nominated actress Caroline Dubberly, conspires to run away from her unhappy working-class life to live with her glamourous aunt. …The Keegan Theatre triumphantly produces a female driven piece that is both deeply relevant and wonderfully entertaining. Along the way, like McGinnis says, they scratch the surface of the lives of women ranging from dowdy secretaries to religious leaders and mythic characters. While Hollywood struggles to produce projects with one, Caryl Churchhill’s “Top Girls” has fifteen incredibly drawn female characters. Susan Marie Rhea, Keegan’s artistic director, starts off the play as Isabella Bird, a famous Victorian explorer. But Rhea really shines in the character of Joyce, a working-class woman in Margaret Thatcher’s England and Marlene’s sister. Her tension and heartache are palpable. The two sisters’ heated battle over each other’s political views, played masterfully by Rhea and Hilleard, is set in the 1980s, it could have been stolen from the dining room tables of millions of Americans on November 8th, 2016. As both Angie, Marlene’s peculiar and immature niece, and Dulle Gret, a mostly mute Flemish warrior, Dubberly is fantastic, reveling in the physical comedy of both roles, never missing a comedic beat. Shakespearean actress Jessica Lefkow expertly plays Pope Joan, the first and only female to rise to the highest position in the Catholic church (as far as anyone knows). 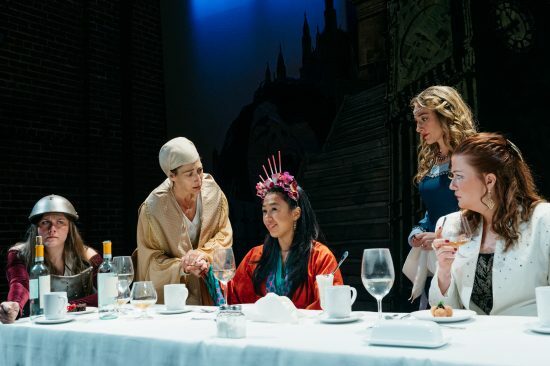 Making her Keegan Theatre debut after recently playing Squeaky Fromme in Pallas Theatre’s “Assassins” Alexandra Palting perfectly captures the 13th century Japanese concubine and Buddhist nun Lady Nijo and 19th century headhunter Win. Daven Ralston, fresh from her turn as Young Woman in Studio’s impressive dual productions of “Three Sisters” and “No Sisters,” shows her versatility in her various roles: The Waitress, Kit, Shona and Louise. As you can imagine with fifteen separate characters, spanning across at least five or six different time periods, the costumes are extremely important in this show. Signature Theatre’s Alison Samantha Johnson returns to The Keegan after designing “Next to Normal” and “What We’re Up Against.” The realism of a character like Joyce and the fancifulness of a story character like Patient Griselda or Lady Nijo are fully realized in the clothes that they wear. In 2017, it’s discouraging to think that Hollywood is still struggling to come up with ways to get women on screen, or with ways to treat women appropriately off screen. Set against this backdrop once again, The Keegan Theatre triumphantly produces a female driven piece that is both deeply relevant and wonderfully entertaining. In this intimate space with this incredible script, a formidable cast, beautiful sets and costumes, and inspired direction, this show is a must-see. Running Time: 2 hours and 35 minutes with two ten minute intermissions. Advisory: Adult content and language. “Top Girls” runs from November 4th to December 2nd at The Keegan Theatre for tickets or more information click here.